The ambassador of Czech Republic in Pakistan, Mr. Jan Fury visited higher education commission of Pakistan and also held meeting with chairman of HEC Dr. Mukhtar Ahmed. In the meeting, the chairman presented the ambassador, the initiatives and achievements of HEC till its inception and the chairman also briefed him about the government’s commitment for the development of higher education and the increment in funding for the change. The chairman said that primary aim of the HEC is to develop the human resource for all disciplines and provide the desired opportunities to faculty and for research to students so that their potential could come forward. The ambassador on the occasion appreciated the achievements of HEC in the areas of human development, IT and research and called it a role model for the developing countries. On the occasion, the ambassador showed his interest for the collaboration in higher education and to establish environment for the institutions linking. 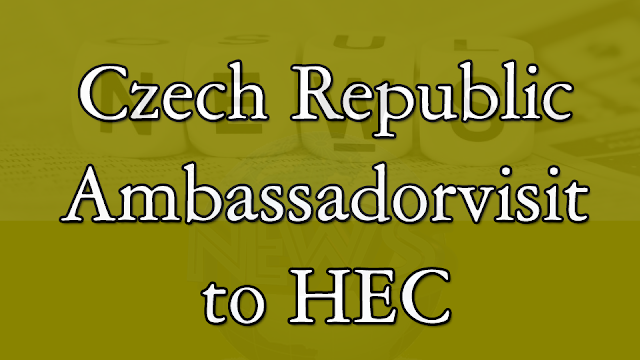 The ambassador also informed HEC chairman that Pakistani literature has been translated into Czech language while the Czech literature is yet to be translated in Urdu language. The chairman on the point appreciated the interest of ambassador in Urdu language and proposed the establishment of Pakistani chair in Czech universities. In the meeting, it is decided that a group of vice chancellors of the Pak universities will visit the Czech Republic this years and institution heads of Czech universities will also come after that. The objective of these vice chancellor visits is to explore the potential for institution linking and the opportunities for research and students exchange and areas of mutual interest. Dr. Mukhtar Ahmed said that he will fully cooperate in this matter and decided programs will be executed. The ambassador of the Czech Republic after the meeting hoped that cooperation in area of higher education will help to boost the relations on government and public level and both nations will come close to each other. In past years, Pakistan has not strengthened the relations with the European nations. The reasons were many, from the instability of government to the attitude of bureaucracy and corruption the system, which affected the smooth implementation of the programs. Now! The interest by the Czech Republic for cooperation in higher education is great as we can develop our faculty through these programs and various projects of the research can get the required funding. In case, student exchange programs are decided then students would get an opportunity to visit and study in European universities. It depends upon the education policy makers and HEC on how to use this cooperation for the benefit of students.